After a short break reading other books and spending time in distant literary lands, I’m back in the world of shadowhunters with the 5th installment in Cassandra Clare’s City of Lost Souls. I’ve voraciously devoured Clare’s 7 books over the last 6 months, but I unfortunately just discovered that the next one isn’t due out until March 2013 (Clockwork Princess), so I feel rather sheepishly like I should have paced myself a little better. However, if you’re a fan of Clare’s work, I’m sure you realize just how difficult that would be. 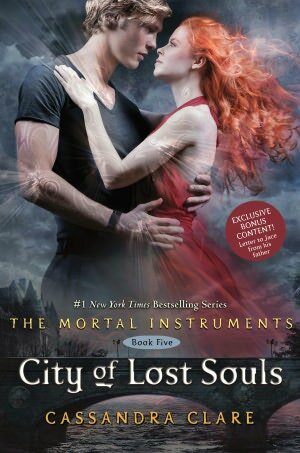 City of Lost Souls is probably my favorite book in The Mortal Instruments series (so far). Action packed, but laced with true conflict and surprising character developments, it renewed my interest in the series. Picking up where the cliffhanger at the end of City of Fallen Angels left off, Clare dives in to the action and leads the reader in to a thicket of unanswered questions, plot twists and challenges. There seemed to be many more mature situations for the characters to deal with in this book ranging from trust issues in relationships, to letting one’s guard down to open up to their partner, to fighting for love when all hope seemed lost. It was watching these supernatural characters tackle these real life issues that drew me to this book above the rest. There was a traumatic moment when one of the characters is sexually assaulted, and the way in which, the complex emotions she faces in this situation were articulated led me to develop an entirely new respect and appreciation for Clare. She’s not just telling a story about fairies and demons, she’s shedding light on very real evils. There’s been a lot of talk about whether or not Clare should have continued writing in to the story, after her planned trilogy ended with City of Glass, creating a divide amongst fans as to whether they would keep reading or not. Clearly, I’m in the, “there’s more? let me at ’em!” camp, but that’s not to say I don’t respect others for stopping where they did. Yes, it was frustrating in the fourth book, City of Fallen Angels, when pretty much nothing happened except for Sebastian coming back from the dead and kidnapping Jace, but my patience paid off in this fifth installment. A lot happens, and it was so engrossing, I read it in double time. Plus we get to meet the elusive Iron Sisters, watch Clary sparr with the Seelie Queen, and see these characters we’ve become so familiar with evolve from teens in to young adults. « Clockwork Princess Cover Revealed Today!